649 EP SAAR (1921) Signal bridge, Saarbrucken*. Imperforate proof pair with overprint. Scott No 89. 1783 EP SAAR (1921) Slag pile at Volklingen*. 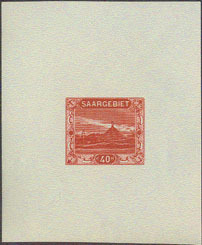 Die proof in issued colors printed on thin white paper. Scott No 73, Yvert No 58. 650 EP SAAR (1922) Old bridge at Saarbrucken*. Die proof in issued colors. Signed HOFFMANN. Scott No 101, Yvert No 85. Full gum. 1784 EP SAAR (1922) Cable railway, Ferne*. Die proof in unissued colors. Signed NEY. Scott No 102, Yvert No 86. Hinged. 3643 EP SAAR (1922) Old bridge at Saarbrucken*. Die proof in black & white. Scott No 101, Yvert No 85. 3644 EP SAAR (1922) Old bridge at Saarbrucken*. Die proof in unissued colors. Scott No 101, Yvert No 85. Full gum. 4742 EP SAAR (1922) Cable railway, Ferne*. Die proof in black & white. Signed NEY. Scott No 99, Yvert No 83. Ungummed.